Forgotten Hollywood » Blog Archive » “Forgotten Hollywood”- Pop Culture Confab in June! « “Forgotten Hollywood”- MIDWEST BOOK REVIEW… 5-Stars! “Forgotten Hollywood”- Pop Culture Confab in June! 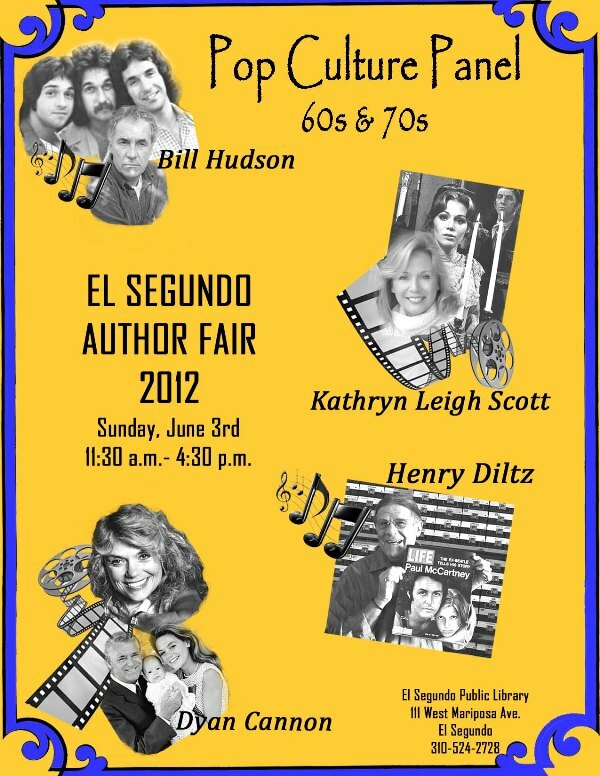 The 2012 El Segundo Author Fair is Sunday, June 3rd. Expected are 35 local authors and poets, covering such topics as mystery, memoir, travel, cooking, children’s, music, and more. Authors will meet and greet the public at signing tables, while poets read their works in the Rose Garden Room. Of course, I’ll be autographing copies of my Forgotten Hollywood Book Series. I’m thrilled to be moderating a Pop Cultural Icon Panel at 2:30p, which should include a spirited discussion. Our guests are true legends in the field of cinema, television, photography, and music. I hope you might visit a special afternoon of literary fun! This year’s Author Fair is cheerfully co-sponsored by the El Segundo Public Library and Friends of the El Segundo Public Library. This entry was posted on Wednesday, May 16th, 2012 at 12:00 am	and is filed under Blog by Manny Pacheco. You can follow any comments to this post through the RSS 2.0 feed. Responses are currently closed, but you can trackback from your own site.